An Aberdeenshire care home has apologised after an elderly resident was left severely bruised from a fall. It is believed Jill Symmonds, 78, fell from the toilet while suffering a seizure at Sunnybank Care Home, Cruden Bay. Mrs Symmonds' family claims that no-one from the care home called to let them know about the incident. Meallmore Ltd, which runs the care home, said the lack of contact was "unacceptable". Mrs Symmonds' granddaughter, Emma Stephen, published a Facebook post on Tuesday condemning the incident, which has been shared more than 1,000 times. In the post, she said her family did not find out about the fall until nine hours after Mrs Symmonds had been taken to hospital, and even then they were only told after calling Sunnybank themselves. She also said her grandmother, who suffers from dementia and epilepsy, had previously broken both her legs in separate incidents due to being left alone on the toilet. 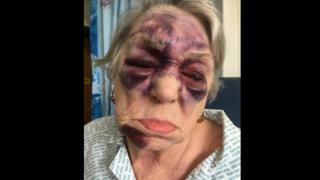 The fall left Mrs Symmonds with two black eyes and severe bruising around her face. Speaking to BBC Scotland, Mrs Stephen said: "This is the most traumatic thing I've ever had to see. "We have a meeting next week with the care home manager, and social work are also involved. "There are just so many questions to be answered. The responsibility has to lie somewhere." Mrs Symmonds has since been discharged from hospital and is back in Sunnybank Care Home "in good spirits", according to her granddaughter. She has been a resident of the care home for around six years after moving from her home in Cruden Bay. In her Facebook post, Mrs Stephen went on to write: "I would like to state that not all carers in Sunnybank are like this, in fact most of them do a fantastic job and I hold my hat off to them for the work they do." A Meallmore spokesperson said the Care Inspectorate and other relevant authorities have been informed of the incident, and the manager of Sunnybank has been in contact with the family. "We are still reviewing the incident and, as is our policy following any significant event, we will undertake a full review with the resident, her family and other relevant professionals to update the resident's care plan to minimise the risk of a future incident. "The fact the resident's family weren't alerted as soon as she was admitted to hospital was unacceptable and we wholeheartedly apologise. "This is being addressed with the staff member concerned and has been identified as a re-training issue. We take the prevention of falls very seriously and each resident is assessed, in line with national falls guidance, to limit their risk. "However, it is important to note we do not restrict movement or choice of people in our care. As a company, we take matters like this extremely seriously, as the care, comfort and security of our residents is always our top priority."